I knew that Raffine would nail it if he checked all the wrong guesses. He be smart like dat. I hafta agree-Raffine is an expert at old obscure b-films. If I hadn't screwed up the clues with the Tom Tyler reference,he would have gotton it much easier,I'm sure! I have no shame. When TCM ran a 'Jungle Jim' marathon a few months ago - I was there. July: A bunch of Rusty the Wonder Dog movies! Oh oh oh!! Is that The Court Jester? "I'm a big boy now, Johnny." ......"Now toddle off and fly your flying machine." That's the one! 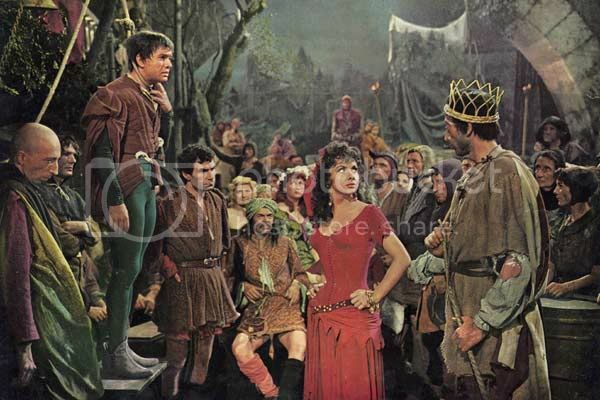 With Anthony Quinn as Quasimodo and Gina Lollobrigida as Esmerelda. This might be especially hard, because I doubt that anyone can guess the actor by the hands. However, it might be especially easy for anyone who has been to the movies lately. Much more recent. This year, actually. Sorry, no (actually never heard of this). Hint: The guy in the picture always orders two espresso in two separate cups. When he gets a double-espresso in one cup he loses his control somewhat (winkwink). I would have gotten that if the movie had played here.